There are many resources for this protocol and you can easily do an internet search for more in-depth information. As usual, I had to mull over the research for awhile before it started to make sense. So here is my very un-medical, Jane-ease overview of the flaxseed oil and cottage cheese diet. Maybe it will help you decide if this cancer diet is something you want to try. First of all, Flaxseed oil is the oil made from Flax seeds. Sometimes the flax seeds are called linseeds, but for our discussion I will call it flaxseed oil. And cottage cheese is well, cottage cheese… so far, so good. The flaxseed oil and cottage cheese diet is that simple. Mix the two together and eat it. Every day. Simple. Of course, we couldn’t let it be that simple. We had to figure out the Why of it. That’s where it gets interesting. This protocol was developed several decades ago by a German biochemist named Dr. Johanna Budwig. The diet is often called the Budwig Diet in her honor. Dr. Budwig’s research centered on the important role of essential fatty acids in our body. They are called essential because they are critical to good health. We all need essential fatty acids, but our body doesn’t make them. We have to eat them or include them in our daily diet. Essential fatty acids are found in vegetables, fish, seeds and nuts. There is one thing about these oils though. They will spoil quickly if left in the heat or sunlight for any length of time. So the food industry has developed ways to chemically alter the oils to give them a longer shelf life. These new chemically altered essential fatty acids are turned into harmful, processed oils that are now called hydrogentated or partially hydrogentated fats and oils. If you’ve listened to Dr. Oz at all, I bet you’ve heard him say that we need to cut these harmful hydrogentated fats out of our diet. Dr. Budwig would agree. She found that many people were becoming deficient in two particular essential fatty acids, omega-3 and omega-6. Both of these fatty acids play a big role in protecting our bodies from cancer. Our bodies use these essential fatty acids, mostly the omega-3, to line and protect the cell membranes. Each and every cell membrane in our body. When we don’t have enough essential fatty acids, the cells are “unprotected.” And if you will refer to our What is Cancer page, you know that tumors develop from cells gone awry. Dr. Budwig proposed that there is very likely a connection to the deficiency of essential fatty acids and cancer. She believed that cancer was a result of not “too much” cell growth, but of “faulty” cell growth. When the cells tried to grow and divide, there wouldn’t be enough of the essential fatty acids to completely cover the new cell, so it would remain in the mother cell, but with a full set of new chromosomes. Not normal. Cells gone awry. Cancer potential. The omega-6 essential fatty acid is primarily used in the production of hemoglobin. And if you refer to our Back to the Blood Basics page, you know that hemoglobin is essential for carrying oxygen to all the cells. Again, critically important to our good health. Starting to see the significance of essential fatty acids yet? Our body doesn’t make them. We have to eat them. But many of us are deficient in these good essential fats. Consider the flaxseed oil and cottage cheese diet. Mom did. I only wish we had read about it sooner and could have given it a fair try. Perhaps it would have made a difference. Perhaps not. I have promised to always be honest. Who knows if it would have helped. But mom talked with her doctor, as always, and felt that it could do no harm. So we tried it. Here’s why Dr. Budwig combined these two very different products into one diet. She found that the body absorbs the natural essential fatty acids best when combined with a sulfur-based protein. Flaxseed oil is an extremely rich source of both the omega-3 and omega-6 fatty acids. 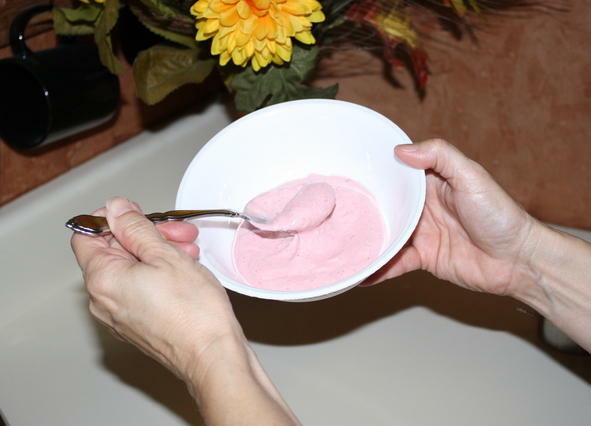 Cottage cheese is a perfect sulfur-based protein. 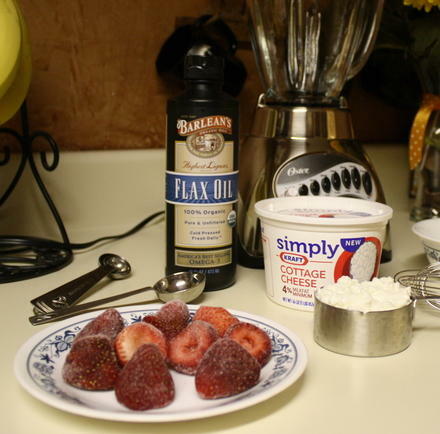 Put the two together and there you have the basics for the Flaxseed Oil and Cottage Cheese Diet. - only use unrefined, cold-pressed flaxseed oil that is sold in a dark, light-blocking bottle and kept refrigerated at all times. I found the Barleans brand at our local health food store. 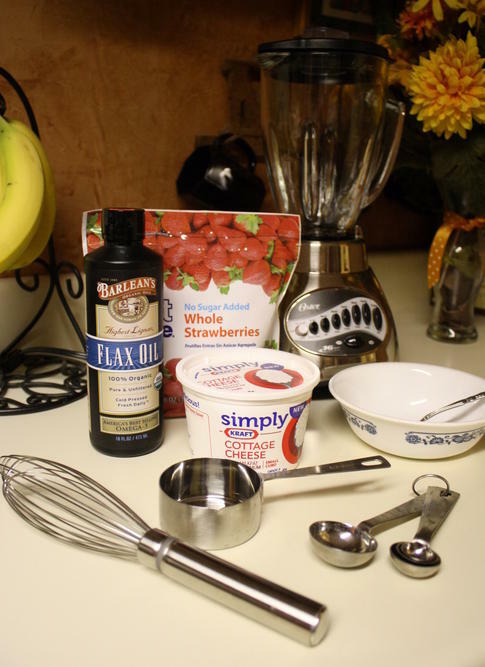 - always mix the oil and cottage cheese together in a blender or mixer to ensure the essential fatty acids are binding with the sulfur-based proteins. - when on the flaxseed oil and cottage cheese diet, Dr. Budwig did have some dietary restrictions. She recommended cutting out all animal fats, salad oils, margarines and even butter from your diet, as well as any unrefined sugar, although she allowed unsweetened grape juice and honey. I’ll be honest, we didn’t get quite that restrictive, but in order to be fair and give the diet a chance these are the suggestions she makes. - start slow at the beginning. 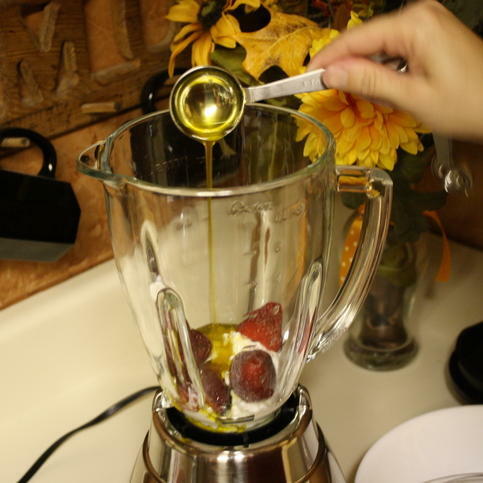 Increase the amount of oil gradually. As you know, pancreatic cancer can drastically affect the normal digestive process. Adding in a sudden, huge dose of oils, even good ones, can cause stomach upset. So start slow. And that brings me to the actual recipe. Dr. Budwig suggested that the minimum ratio of oil and cottage cheese should be 1 tablespoon flaxseed oil to ¼ cup cottage cheese per day. But she also recommended going as high as 3-6 tablespoons of flaxseed oil to ½ cup cottage cheese per day for cancer patients. 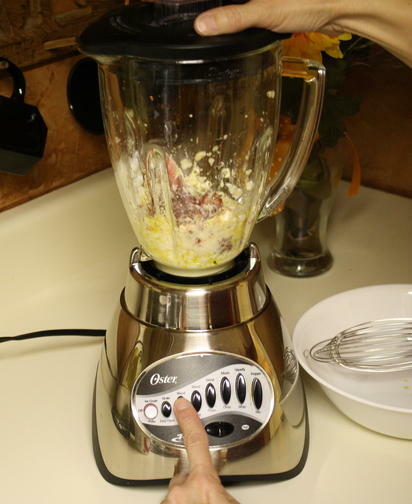 Using a blender or mixer, mix the flaxseed oil and cottage cheese until well blended. 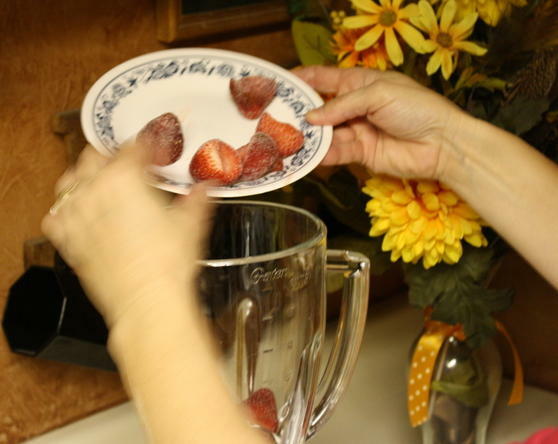 You can add in fresh or frozen fruits, unsweetened grape juice, honey or milk to taste. Keep this mixture refrigerated and eat it throughout the day. * Important Note: If you are allergic to dairy products, please talk with your health care provider before trying this diet. 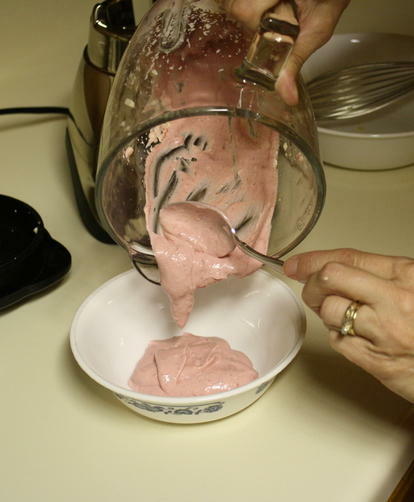 Mix all together in blender and refrigerate in covered container. Eat small portions throughout the day. 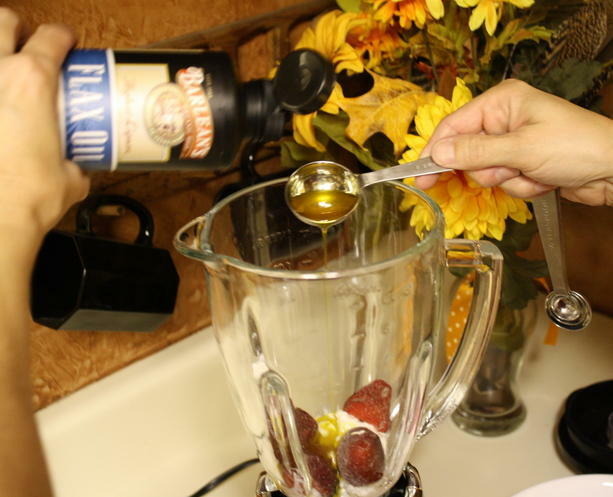 Dr. Budwig appeared to have great success with her Flaxseed Oil and Cottage Cheese Diet during her lifetime, using it to treat a variety of cancers and health problems. I truly wish that there were documented studies of this protocol for pancreatic cancer, just as there are clinical trials for new chemotherapy drugs. Then maybe we would know if this diet was a viable treatment option for pancreatic cancer patients. For now, it is basically a self-administered cancer therapy. I would be grossly remiss at this point if I didn’t strongly urge you to consider all alternative therapies very carefully. Before you attempt any new treatment on your own, we encourage you to talk it over with your doctor and cancer team. It is true that food-derived antioxidants, minerals and even essential fatty acids play an important role in our health. Making the decision to eat a particular food or natural product for benefit should be done only after much research. The information we provide in this website is for informational purposes only and is not intended as a substitute for advice from a health care professional. It should not be used for diagnosis or treatment of any health problem or construed as a prescription of a medication or other treatment. And so, after all the legal mumbo-jumbo, it is really your choice. Mom tried the flaxseed oil and cottage cheese diet, but we just didn’t have time on our side. I believe she would want me to continue sharing our journey, and this is a part of it. Our goal together is Wholeness and Healing!